Cancún (/kænˈkuːn/ or /kɑːn-/; Spanish pronunciation: [kaŋˈkun]) is a city in southeast Mexico on the northeast coast of the Yucatán Peninsula in the Mexican state of Quintana Roo. It is a significant tourist destination in Mexico and the seat of the municipality of Benito Juárez. The city is on the Caribbean Sea and is one of Mexico's easternmost points. Cancún is just north of Mexico's Caribbean coast resort band known as the Riviera Maya. In older English-language documents, the city’s name is sometimes spelled "Cancoon," an attempt to convey the sound of the name. There are two possible translations of Cancún, based on the Mayan pronunciation kaan kun. The first translation is "nest of snakes". The second version and less accepted is "place of the gold snake". The shield of the municipality of Benito Juárez, which represents the city of Cancún, was designed by the Mexican-American artist Joe Vera. It is divided into three parts: the color blue symbolizes the Caribbean Sea, the yellow of the sand, and the red of the sun with its rays. The name Cancún, Cancum or Cankun first appears on 18th-century maps. The meaning of Cancún is unknown, and it is also unknown whether the name is of Maya origin. If it is of Maya origin, possible translations include "Place/Seat/Throne of the Snake" or "Enchanted Snake". Snake iconography was prevalent at the pre-Columbian site of Nizuc. When development of the area as a resort was started on January 23, 1970, Isla Cancún had only three residents, caretakers of the coconut plantation of Don José de Jesús Lima Gutiérrez, who lived on Isla Mujeres. Some 117 people lived in nearby Puerto Juárez, a fishing village and military base. Due to the reluctance of investors to gamble on an unknown area, the Mexican federal government financed the first nine hotels. The first financed hotel was a Hyatt, Cancún Caribe, but the first hotel built was the Playa Blanca, which later became a Blue Bay hotel. It is now named Temptation Resort. At the time it was an elite destination, famous for its virgin white sand beaches. The city began as a tourism project in 1974 as an Integrally Planned Center, a pioneer of FONATUR (Fondo Nacional de Fomento al Turismo, National Fund for Tourism Development), formerly known as INFRATUR. Since then, it has undergone a comprehensive transformation from being a fisherman's island surrounded by virgin forest and undiscovered shores to being one of the two most well-known Mexican resorts, along with Acapulco. The World Tourism Organization (WTO), through its foundation UNWTO-Themis, awarded the Best of the Best award "for excellence and good governance" to the Trust for Tourism Promotion of Cancún on February 3, 2007. This award ensured Cancún the ongoing support of the Department of Education and Knowledge Management of the WTO. Most 'Cancunenses' are from Yucatán and other Mexican states. A growing number are from the rest of the Americas and Europe. The municipal authorities have struggled to provide public services for the constant influx of people, as well as limiting squatters and irregular developments, which now occupy an estimated ten to fifteen percent of the mainland area on the fringes of the city. In the 21st century, Cancún had largely avoided the bloodshed associated with the trade of illegal drugs, but is known for its retail drug sales to tourists as well as for being a center of money laundering. The links with Cancún date from the 1990s and early 2000s, when the area was controlled by the Juárez and Gulf drug cartels. In recent years Los Zetas, a group that broke away from the Gulf Cartel, has taken control of many smuggling routes through the Yucatán, according to the U.S. Drug Enforcement Administration. The 2010 United Nations Climate Change Conference was held in Cancún from November 29 to December 10 of that year. Ave. Tulum is the main north-south artery, connecting downtown to the airport, which is some 30 km (19 mi) south of downtown. Tulum is bisected by Ave. Cobá. East of Ave. Tulum, Cobá becomes Ave. Kukulcan which serves as the primary road through the 7-shaped hotel zone. Ave. Tulum ends on the north side at Ave. Paseo José López Portillo which connects to the main highway west to Chichén Itzá and Mérida. Another major north-south road is Ave. Bonampak which runs roughly parallel to Ave. Tulum. The main ferry to Isla Mujeres is located in Puerto Juárez, on Ave. Paseo José López Portillo. To save on the cost of installing sewer systems and other public services, the design of much of the rest of the city reverted to the grid plan after Hurricane Gilbert in 1988. [citation needed] The newest upper-middle-class residential areas reflect the original plan, but are much less intimate. Less expensive developments are composed almost entirely of identical one- or two-story small row-houses, sometimes built around interior plazas or 4-story apartment blocks. [citation needed]Until recently, most mainland buildings were four stories or shorter; since 2005, there has been an influx of condominium and luxury retail and office space concentrated along Ave. Bonampak. Cancún's mainland or downtown area has diverged from the original plan; development is scattered around the city. The remaining undeveloped beach and lagoon front areas outside the hotel zone are now under varying stages of development, in Punta Sam and Puerto Juarez to the north, continuing along Bonampak and south toward the airport along Boulevard Donaldo Colosio. One development abutting the hotel zone is Puerto Cancún; also Malecon Cancún is another large development. Despite being a young city, Cancún has a memorial monument of its foundation on a replica of the old Airport Control Tower that resembles to its own date of foundation. The original control tower was a provisional wooden structure to satisfy the operative needs of the recently created airport. Some documents of the city mention that in that time there were no other formal buildings constructed in the city, being possibly the first built structure of Cancún's recent history. The old airport was located on the same part of the city that today corresponds to the Kabah Avenue. The tower is 15 meters tall, has a staircase of 45 steps, and has a base dimension of 5 × 5 meters. The memorial was first built in 2002, with the donations of Aerocaribe, a local airline, but the structure was damaged after Hurricane Wilma in 2005. After the claims of the local people asking to rebuild the tower memorial, a new version was built on 2010, which was later abandoned without proper maintenance until Woox Pinturas, another local wood maintenance company, made a donation to restore the structure to its original appearance. Close by in the Riviera Maya and the Grand Costa Maya, there are sites such as Cobá and Muyil (Riviera) the small Polé (now Xcaret), and Kohunlich, Kinichná, Dzibanché, Oxtankah, Tulum, and Chacchoben, in the south of the state. Chichén Itzá is in the neighboring state of Yucatán. Cancún is served by the Cancún International Airport with an added main runway that commenced operation as of October 2009. It has many flights to North America, Central America, South America, Asia, and Europe. It is located on the northeast of the Yucatán Peninsula serving an average of about fifteen million passengers per year. The airport is located around 20 km (12 mi) from the hotel zone, approximately a 20 minute trip by car. The island of Isla Mujeres is located off the coast and is accessible by ferry from Puerto Juárez and Playa Tortugas in the Hotel Zone. Cancún is also served by three private bus lines that connect it to the downtown area and the "hotel zone" as well as more distant destinations such as Playa del Carmen and Tulum. Cancún has a tropical climate, specifically a tropical monsoon climate (Köppen Am), with little difference between seasons, but pronounced rainy and dry seasons. The city is hot year-round, and moderated by onshore trade winds, with an annual mean temperature of 27.1 °C (80.8 °F). Unlike inland areas of the Yucatán Peninsula, sea breezes restrict high temperatures from reaching 36 °C (97 °F) on most afternoons. Annual rainfall is around 1,340 millimetres (52.8 in), falling on 115 days per year. The rainy season runs from May through late October, when hot temperatures, high humidity, and quick, but intense summer thundershowers are common. The dry season normally begins in December and runs through April, when more temperate conditions occur as the northeast trade winds bring northerly breezes, sunshine, and relative humidity is lowest. The hotel zone juts into the Caribbean Sea, it is surrounded by ocean therefore daytime temperatures are around 1-2C less and windspeeds are higher than at the airport located some distance inland, which is the official meteorological station for Cancún, averages as shown below. Thanks to the Yucatán current continually bringing warm water from further south, the sea temperature is always very warm, with lows of 79 °F (26 °C) in winter and highs of 84 °F (29 °C) in summer. The tropical storm season lasts from May to December, the rainy season extends into January with peak precipitation in October. February to early May tend to be drier with only occasional scattered showers. Cancún is located in one of the main Caribbean hurricane impact areas. Although large hurricanes are rare, they have struck near to Cancún in recent years, Hurricane Wilma in 2005 being the largest. Hurricane Gilbert made a devastating direct hit on Cancún in September 1988 and the tourist hotels needed to be rebuilt. In both cases, federal, state and municipal authorities were well prepared to deal with most of the effects on tourists and local residents. Hurricane Dean in 2007 also made its mark on the city of Cancún. 1988's Hurricane Gilbert was the second most intense hurricane ever observed in the Atlantic basin. It landed on the Yucatán peninsula after crossing over the island of Cozumel. In the Cancún region, a loss of $87 million (1989 USD) due to a decline in tourism was estimated for the months October, November and December in 1988. On October 21, 2005, Hurricane Wilma made landfall on Mexico's Yucatán Peninsula as a powerful Category 4 hurricane, with strong winds in excess of 150 mph (240 km/h). The hurricane's eye first passed over the island of Cozumel, and then made an official landfall near Playa del Carmen in the state of Quintana Roo at around midnight on October 22 EDT with winds near 140 mph (230 km/h). Portions of the island of Cozumel experienced the calm eye of Wilma for several hours with some blue skies and sunshine visible at times. The eye slowly drifted northward, with the center passing just to the west of Cancún, Quintana Roo. Two years later after Hurricane Wilma, in 2007, Hurricane Dean made landfall as a Category 5 storm in Majahual, 190 miles (310 km) to the south of Cancún. Fierce winds at the edge of Dean's impact cone stripped sand off 7.5 miles (12.1 km) of beaches from Punta Cancún (Camino Real Hotel) to Punta Nizuc (Club Med). The authorities asked tourism operators to suspend sending tourists to Cancún while Hurricane Dean was approaching, but did ask airlines to send empty planes, which were then used to evacuate tourists already there. Although Cancún is better known as a travel and tourism destination, in recent years some colleges and universities have been offering higher education to both Mexican and foreign students. The city has been home to Atlante F.C., a traditional Mexico City football club, since 2007. Atlante F.C. was moved to Cancún's Andrés Quintana Roo Stadium when that stadium opened. Its games had low attendance at its previous stadium, Azteca Stadium, which it had been renting. The team currently plays in the Ascenso MX, the second level of the Mexican football pyramid. 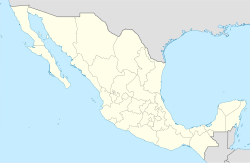 The city is also home to the baseball team Tigres de Quintana Roo, who play in the Mexican League (LMB). Andrés Quintana Roo Stadium, with a very slight increase in its capacity that intended, for Atlante F.C. The city has been devastated by violent acts related to drug trafficking. Between 2013 and 2016 there were 76 murders, in 2016 they count 31 murders , and at least 193 during 2017, the vast majority related to drug trafficking, in the urban nucleus and, various violent episodes with firearms in the so-called "Zona Hotelera". Beginning in 2018 with a high wave of violence, Cancún is above the national average in homicides, only in January there were 33 homicides, triple the number of homicides in January 2017. The violent acts have begun to put pressure on the tourism industry, where in January 2019, Cancún saw its first decrease in international passengers in seven years. ^ "Cancún". Merriam-Webster Dictionary. Retrieved 2016-08-11. ^ "OMT concede premio excelencia a la promoción turística de Cancún (México)" (in Spanish). ES: El Economista. February 3, 2007. ^ "Fast Facts". ’’World Atlas’’. Retrieved 2013-04-18. ^ Varillas, Adriana (August 19, 2013). "Centro de Cancún, tan mexicano como cosmopolita". El Periodico de Quintana Roo. Archived from the original on October 6, 2014. Retrieved October 6, 2014. ^ "MEXICO: Quintana Roo". Citypopulation.de. 2012-01-08. Retrieved June 1, 2012. ^  A proper Maya spelling of Nizuc may be “Ni’ su’uk” which translates to “promontory” or “point of grass”-Source-Some Historic Notes and Observations on Isla Cancún, Quintana Roo], published at FAMSI by Andrews, Anthony P.
^ "Government of Mexico, Cancún 2014". cancun.gob.mx. ^ "Snake iconography was prevalent at the pre-Columbian site of Nizuc-Source- Historic Notes and Observations on Isla Cancún, Quintana Roo". famsi.org. FAMSI. p. 5. ^ a b c Siegel, Jules (2006). Cancun User's Guide. Lulu.com. p. 204. ISBN 1-4116-3944-8. ^ Booth, William (May 27, 2010). "Mayor of Cancun, Mexico, charged with drug trafficking, money laundering". Washington Post. Associated Press. ^ Hawley, Chris (May 26, 2010). "Drugs cast cloud over Mexican paradise". USA Today. Retrieved 2010-05-27. ^ "Location". Puerto Cancun. Archived from the original on May 10, 2013. Retrieved August 26, 2013. ^ http://www.revistapioneros.com/la-antigua-torre-de-control-simbolo-de-la-fundacion-de-cancun/ Cancún's Airport Old Control Tower. ^ "Cancun weather – water temperature". Cancunmap.com. Archived from the original on July 27, 2013. Retrieved August 26, 2013. ^ "Normales Climatológicas 1951–2010" (in Spanish). National Meteorological Service of Mexico. August 2011. Archived from the original on July 5, 2015. Retrieved March 6, 2015. ^ "Cancun Climate and Weather Averages, Cancun and Riviera Maya". Weather to Travel. Retrieved 9 July 2013. ^ Benigono Aguirre. "Cancun [sic] under Gilbert: Prelimenary [sic] Observations" (PDF). International Journal of Mass Emergencies and Disasters March 1989, Vol. 7, No.1, pp. 69–82. Archived from the original (PDF) on December 10, 2005. Retrieved October 1, 2006. ^ a b "Se disparan 162% los homicidios en Cancún". www.milenio.com. ^ "Abaten a tiros a mujer en Cancún, llegan a 193 asesinatos este año". yucatanalamano.com. ^ a b "En 2017, crimen organizado mató a 111 en Cancún". www.milenio.com. ^ "Quintana Roo, por arriba de la media nacional en homicidios". noticaribe.com.mx. January 9, 2018. ^ "Se disparan 300% los homicidios en Cancún - La Palabra del Caribe - Periodismo con ética - Noticias de Quintana Roo". lapalabradelcaribe.com. February 1, 2018. ^ "Baja por primera vez en 7 anos Illegada de turistas internacionales a Cancún". February 24, 2019. ^ "Wichita Sister Cities". City of Wichita. Retrieved 25 July 2018. Wikimedia Commons has media related to Cancún. Wikivoyage has a travel guide for Cancun.